Get a vacation body on your lunch break! Get results with your CoolSculpting experts located in Bowling Green! Look your best starting today! Get started today with a FREE Consultation. Sit back, relax, and say goodbye to stubborn fat in 1 hour! It’s called stubborn fat for a reason: No matter how healthy you eat and excercise, it’s virtually impossible to lose those annoying muffin tops, love handles, and belly fat. Only CoolSculpting targets fat cells alone, eliminating them in an easy, non-intrusive procedure that exercise and diet can’t achieve as quickly or effectively - The perfect alternative to liposuction! Unlike a lot of other procedures, CoolSculpting takes very little time and is pretty simple to fit into your daily life. After your CoolSculpting treatment, you can typically get right back to your busy day. Each treatment lasts one hour - The same time you might spend at the gym. So you can easily fit your appointment into a lunch break. 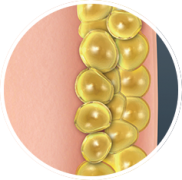 Procedures that use laser, sonic waves and even surgery to remove fat can actually destroy other tissue in the process by burning, shattering or extracting non-fat cells. This required downtime for your body to heal. Fortunately, Bluegrass Aesthetics CoolSculpting doesn’t burn, shatter or extract any cells! 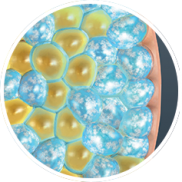 Developed by Harvard scientists, our unique, FDA-cleared, patented procedure uses a targeted cooling process that kills the fat cells underneath the skin, literally freezing them to the point of elimination. Once crystalized, the fat cells die and are naturally eliminated from your body. In a few months, boom: Say hello to a new you. Lose your love handles and belly fat! Freeze away fat with CoolSculpting - How does it work? 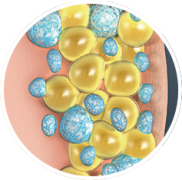 CoolSculpting Technology uses controlled cooling to target and treat fat cells. In the weeks to follow, your body will naturally process the fat cells. CoolSculpting safely reduces the number of fat cells in the body. A. Am I a good candidate? Q. Good candidates have noticeable bulges in certain areas they’d like to get rid of. * The CoolSculpting fat reduction procedure is specifically designed for those who have unwanted fat that resists diet and exercise. * Unlike gastric bypass surgery, the CoolSculpting procedure is not a weight loss solution for people who are obese. It is, however a non-surgical alternative to liposuction. Request a one-on-one consultation with a CoolSculpting provider who will determine if the CoolSculpting procedure is right for you. A. How much does the CoolSculpting procedure cost? Q. The price for CoolSculpting procedures varies depending on your areas of concern, the number of sessions needed, and your ultimate goals. Create a customized treatment plan, in person, with your provider that’s tailored to your body, your goals, and your budget. A. How long is each CoolSculpting session? How many sessions will I need? Q. Your CoolSculpting provider will help you create an individualized treatment plan tailored to your specific goals. The length of your CoolSculpting session will vary depending on the number of areas being treated during one visit. You and your provider may schedule additional sessions in order to meet your goals. A. Where does the fat go after the CoolSculpting Treatment? Q. Once the treated fat cells are crystallized (frozen), they die. 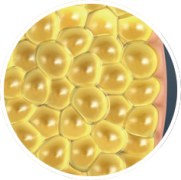 Over time, the body naturally processes the fat and eliminates these dead cells. A. What does the CoolSculpting treatment feel like? Q. As the cooling begins during the first few minutes, you will feel pressure and intense cold. This soon dissipates. Many people read, watch videos, work on their laptop, or even take a nap during their treatment. A. Is the CoolSculpting procedure safe? Q. The CoolSculpting procedure is FDA-cleared for the treatment of visible fat bulges in the submental area, thigh, abdomen and flank. With over two million CoolSculpting procedures performed, it is proven to be a safe and effective treatment for non-surgical fat reduction. A. Are there any side effects for CoolSculpting? Q. During the procedure you may experience deep pulling, tugging, pinching, numbness or discomfort. * Following the procedure, typical side effects include temporary numbness, redness, swelling, bruising, firmness, tingling, stinging and pain. * Rare side effects may also occur. The CoolSculpting procedure is not for everyone. You should not have the CoolSculpting procedure if you suffer from cryoglobulinemia or paroxysmal cold hemoglobinuria. The CoolSculpting procedure is not a treatment for obesity. As with any medical procedure, ask your physician if the CoolSculpting procedure is right for you. A. Can I return to normal activities after my CoolSculpting treatment? Q. Yes, you can. The CoolSculpting procedure is completely non-surgical, so typically you can return to normal activities immediately. Often times, patients return to work after their CoolSculpting session is over. A. How long after my CoolSculpting Procedure When will I see results? A. Do I need to take special supplements or follow a strict diet and exercise program after your CoolSculpting Procedure? Q. No supplements or pills are required and you do not have to adopt new diet and exercise habits. Many patients feel more motivated to take care of themselves after their CoolSculpting treatment. It is as if they get a second lease on their body and want to start anew again by taking even better care of themselves. A. What happens if I gain weight down the road? Conveniently located in Bowling Green to serve you!